Multilayered Polymer Capacitors operate up to 125°C. 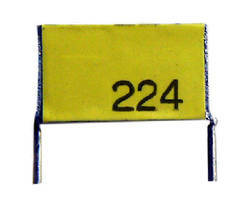 Constructed using stacked metallized polyester, Type RA Capacitors offer capacitance values from 0.1–10.0 ÂµF with voltage ratings of 100, 250, 400, and 500 Vdc. Units are impregnated with microcrystalline polymer sealant and exterior tape wrap that protects element from moisture and eliminates need for external case. Terminated with radial leads, capacitors cover broad range of applications where high-density capacitors are needed for board-level DC filtering. Liberty, SC — Cornell Dubilier announces availability of its Type RA multilayered polymer capacitors for 125°C operation. Type RA capacitors are constructed using stacked metallized polyester protected with an impregnated sealant, which eliminates the need for an external case. This package style offers the highest energy density technology available for switching power supplies, DC to DC converters and other high ripple current applications. “These are excellent high performance filter capacitors in a very small size” says Bill Haddad, Product Manager at Cornell Dubilier Electronics. Type RA capacitors are impregnated with a microcrystalline polymer sealant and exterior tape wrap that protects the capacitor element from moisture, allowing it meet 85 °C/ 85% RH requirements for demanding applications in military vehicles and aerospace. Cornell Dubilier RA capacitors series are available through our key franchised distributor sites for quick turnaround on prototype and preproduction quantities. global company, Cornell Dubilier has ISO-9001 certified manufacturing and distribution facilities in Liberty, SC; New Bedford, MA; Mexicali, Mexico; and Shenzhen, China.